Bonn & Mees Floating Sheerlegs has successfully achieved the certification to ISO 9001 on 4 March 2016. 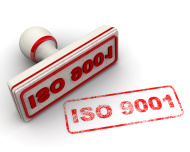 ISO 9001 is the international standard for quality systems. ISO standards set high standards to ensure the quality of the organization and its services. We are proud that we meet these requirements. In 2015 Bonn & Mees became certified to OHSAS 18001 and ISO 14001. Quality and safety have many years of attention in the organization and will be even more emphasized with these certificates. The history of Bonn & Mees was registered in the anniversary book.